It’s Memorial Day! A day to remember the uncommon courage of all those who have protected our country. This is the time to say thank you to the men and women who gave their lives for our freedom. 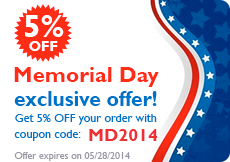 Get 5% off on all orders placed with promo code: MD2014, valid until May 28, 2014. Take advantage of our special Memorial Day Deal now!